Although the situation in Ukraine has grabbed headlines in recent days, President Barack Obama made it clear to Prime Minister Binyamin Netanyahu at their meeting this week that the negotiation framework created by Secretary of State John Kerry is still very much on the agenda. Negotiations are still going on between Israel and the Palestinian Authority, supervised by the U.S. – and that worries Elyakim Ha’etzni, a veteran leader of the settlement movement in Judea and Samaria. In an interview with Arutz Sheva, Ha’etzni said that “the bitter truth” was that Netanyahu had already decided to give in and accept most of the dictates of the U.S. and the Palestinian Authority. 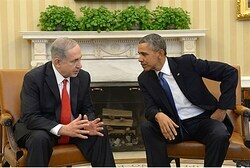 “Netanyahu has agreed to conduct negotiations on the basis of the 1948 armistice lines with some land swaps. There will be a building freeze in Judea and Samaria outside the settlement blocs. He has also surrendered on the issue of an Israeli presence in the Jordan Valley, except for a few guard posts on the Jordan River,” Ha’etzni said. Ha’etzni, an attorney, was involved in the re-establishment of the communities of Gush Etzion Bloc and a Jewish community in Hevron. He was a member of the Yesha Council‘s Steering Committee, and was a former MK for the Tehiya party.